It’s the month of roses, red, chocolate and hearts. 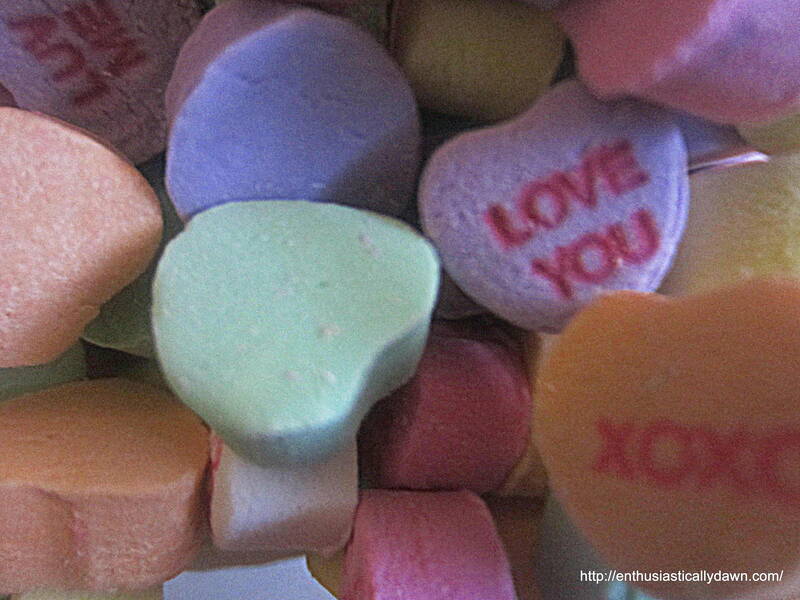 Bonnie, at Faithbarista has given us the prompt “Love” to write about and share. I have been thinking back to the early days- pre-marriage, in light of Valentine’s Day, and thought I would join in with a loving, but humorous look back. I hope you enjoy this stroll down memory lane with my hub and I back to our first “get together” as friends. Our first date. It wasn’t really a date. It was mutually agreed beforehand that it was not a date. Clearly. At least that is how I remember it. It was just a night out to see a movie. In a faraway land, that I knew not. In Rhode Island. Smallest state in the United States. Just sayin’. He drove. I have no recollection of what I wore, or what he drove. Or what I was thinking, initially. Except, this is not a date. We started our “un-date” with a movie which was just released called Scarface, I don’t remember much except that it was gross, bloody, violent and scary. It definitely made me think twice about moving to Florida, at least in the eighties. Of course, that movie went on to it’s own history and fame. What I do remember is He drove and we got lost. In Westerly, Rhode Island. A place neither of us was very familiar with at all, at the time, being small time Rhode-Islanders and all. You think it’s easy living in the smallest state in the United States? There are pockets of RI that I swear are not even on the map. However, I feel pretty safe, relatively speaking when I consider states such as Texas, Maine and California. But, still when you are lost, you’re lost and everything seems foreign and you just want a familiar highway, or at least a sign. A landmark. In Rhode Island we live by landmarks. If you can’t give a proper geographical landmark in Little Rhody, you are not a true Rhode Islander. Course if you are not native to RI, the landmarks are meaningless, but that is a story for another day…Remember this is before the days of GPS, Google and Yahoo Maps! Guess who asked for directions? Oh, wait let’s back up…guess who drove endlessly until I finally pulled rank and asked him to pull into the only place we could find a human being to ask for directions at the late hour (it was @ eleven PM). It was a creepy motel type place, which was not unlike a certain Norman Bates motel. It had a long driveway leading up a hill and it sat low to the ground with one light in the main office. Frightening. Boy, was he in trouble when he finally got back home to Johnston! He broke curfew. And that friends, was the first of many car-rides together. It was also one of many rides together to many places. He mostly still refuses to ask for directions…until I finally pull rank. Or we run out of gas. That’s my story and I’m sticking to it. It’s all I remember. Understand this was about 30 years ago. ACK! Did I just say that out loud? Now we will hear another version. Here is my Hubby’s version of that first outing that will forever be known to us as The Night We Got Lost on What was NOT a FIRST DATE. For the record, I, being the writerly type, who is doing the writing, will edit or adlib as I feel is appropriate. Ahem. Also, for some reason he communicates in bullet points (or asterisks) not paragraphs. Sigh. Men. *He picked me up at my grandmother’s “home”- literally, it was elderly housing at the time. *He had on his long blue Pea Coat (what guy remembers this?) with mints in his pocket (really?). *We ate at a restaurant that had a toy train that went around a track that circled the dining area near the ceiling. *I (not he) went into the hotel to ask for directions. (God’s prophetic humor is woven into our story from the start-CLEARLY). *He got home after curfew and his dad was waiting up for him. His dad didn’t believe the story about us getting lost in Westerly BUT “big brother” stuck up for him because he confirmed the restaurant with a train did really exist. *Dad took the car away from him for two weeks. Fun read Dawn – made me chuckle. Our sermon this Sunday is “He Said, They Said” Part 1 (and the week after is part 2 🙂 ) so even the title made me sit up & pay attention! If I write about my husband – then he DEFINITELY doesn’t read my posts! LOL – all I can say is google map is a wonderful tool for marriages! I LOVED. LOVED your story – both sides. Humor, like salt in soup, is necessary for the best of marriages – and it sounds like you have the best of marriages! I love this! And I am both smiing and shivering as I picture the Bates Motel. My husband never saw Psycho and I keep telling him we must rent it! How fun, to go down memory lane. Isn’t it funny how you and he remember different things. I think men have a different type of memory because they did not loose function of it while having mommy brain. So sweet to look back! Have a beautiful love day tomorrow!! Ha ha ha ha! Yes, to both of you about directions! I think I ate at that restaurant with the toy train, ages ago? Very intriguing to hubby, those things. Also a great one at Yankee Candle Factory if you’re near there. Happy Valentine’s day! Love this! Totally made me smile. Thank you for sharing with Cozy Reading Spot!